Brown claims the title of US National Champion with Blue-Black Midrange, defeating Esper Control in the finals. Follow live streaming video coverage of the 2018 US Nationals on twitch.tv/magic! The hashtag for the 2018 US Nationals is #MTGNationals. Join the conversation. 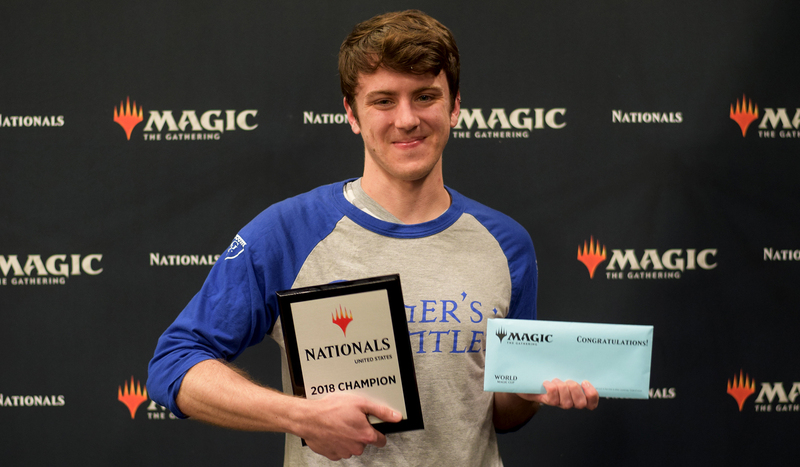 It was a weekend that comes only once a year – US Nationals, when players compete for the title of National Champion and a spot on the US World Magic Cup Team. On Saturday, 739 players arrived at the Greater Columbus Convention Center, ready and eager to play for their chance at the title of US National Champion. After thirteen rounds of Swiss, including two drafts and seven rounds of Standard, eight players moved on to the Top 8 of US Nationals. They were Matthew Nickolai, Chris Andersen, Kevin Jones, Joe Bernal, Dylan Brown, Owen Turtenwald, Justin Andrus, and Brent Clawson. The finals came down to Justin Andrus, a 29-year-old financial analyst from Saint Louis, and Dylan Brown, a 25-year-old server from Port Huron, Michigan. Both had called upon The Scarab God many times throughout the course of the weekend, and would again in the finals. Brown was piloting Blue-Black Midrange, while Andrus brought his own take on Esper Control that included deviations like three copies of Yahenni’s Expertise and a full four copies of Doomfall. Brown took game one, taxing Andrus’s answers with card draw and threats. Andrus took game two with the help of two copies of The Eldest Reborn.It was another grueling game three, as players landed threat after threat, only to see those threats answered. It was Dylan Brown who finally found enough creatures to push through Andrus’s removal and take the game. Congratulations to Dylan Brown, the US National Champion! The lead-up to the World Magic Cup started today, withthe first of five weekends for Nationals worldwide. By this Sunday, the US, Canada, Bulgaria, Ecuador, Singapore, and Costa Rica will have their national champions and two of their World Magic Cup representatives. In Columbus, Ohio, 739 players arrived at the convention center hall, ready and eager to play for their chance at the title of US National Champion. The tournament began with five rounds of Standard, then transitioned into three rounds of Dominaria draft. It's the final weekend for these formats, as Magic 2019 is just around the corner, ready to shake things up. At the end of Day 1's eight rounds, three players stood undefeated, weathering five rounds of Standard and a draft with perfect records. Congratulations to the Day 1 undefeateds, Riley Curren, from Columbus, Piper Powell, from Lexington, Chris Anderson, from Indianapolis! Their Standard decks include two copies of White-Blue God-Pharaoh's Gift and a rogue Jeskai Control. Be sure to tune in tomorrow attwitch.tv/magicto catch the exciting conclusion!